ADA Signs Part One: What are ADA Signs? Here we go, part one of our ADA Sign blog by our expert sign blogger, John Myres. Having been in the sign industry for over 40 years, John’s insights into the sign world are significant, helpful, and unique. ( Learn more about John here.). Our hope is that through this series on ADA Signs, you will learn about the different ADA Sign types, how important they are for any building, whether they are required or not, and that they can be custom designed to fit your specific sign needs. First, we want to take the time to share with just what exactly and ADA Sign is. Part One: What are ADA Signs? Let’s take a brief look at the basics of ADA Signage. The acronym “ADA” represents the “Americans with Disabilities Act.” In this act, laws were established by the Federal Government requiring business and government facilities to make their establishments easier and friendlier for persons with disabilities. One of these required features are ADA Signs. These signs and plaques scattered throughout a building provide valuable information for navigating. Now, there are two basic categories of signs generally referred to as ADA signs: exterior and interior. The goal of exterior ADA Signage is to direct a handicapped person into an accessible parking stall, usually located closest to a building entrance. From there, ADA Signs guide that person through a prepared route with special pavement and sidewalk markings, and ramps, to a building entrance wide enough to accommodate a wheelchair. Along the way there will be those common wheelchair symbols we are all familiar with, decorating several permanent signs and decals. While, interior ADA Signs are, for the most part, actually for the sight impaired. Although, the needs of those in a wheelchair are still seen to with Restroom Door ADA Signs that will have a wheelchair symbol to indicate that the restroom has been modified for wheelchair accommodation. In general, interior ADA Signs and plaques are raised letter signs, designed for use by persons who are sight impaired to identify rooms and areas off of the common hallways of buildings accessible to the general public. 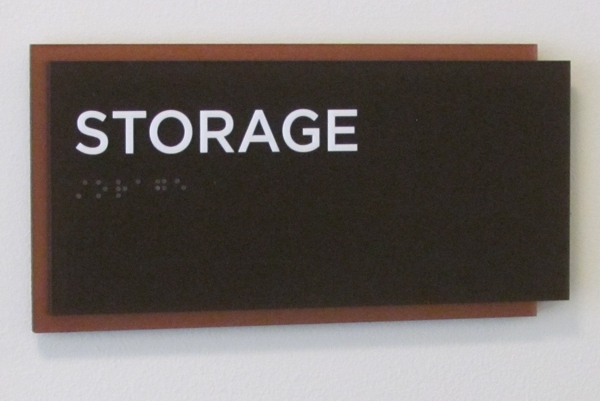 These signs and plaques will also contain braille dots. The good news is, Landmark Signs does both types! And rather than cluttering your parking area or building with plain, boring, unattractive and common off-the-shelf varieties, Landmark Signs can design, manufacture and install completely custom ADA Signs and plaques that will handsomely compliment and enhance your property’s architecture and beauty. Not only do we have decades of experience at determining what the laws require for your complex, we can help you meet those requirements effectively and attractively.